Cape Kamala is 20 minutes go to the north by car from Patong beach. There is a quiet and natural environment. 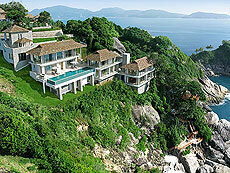 Villa Mihn is a luxury rental villa on the Cape Kamala. This 6 Bedrooms villa in 1213 sqm of area nestles in the quay with great ocean view. The villa could open 1 to 6 bedrooms on request with one to as many as 12 persons for stay.